The movie was originally to be released as Dance with the Devil. 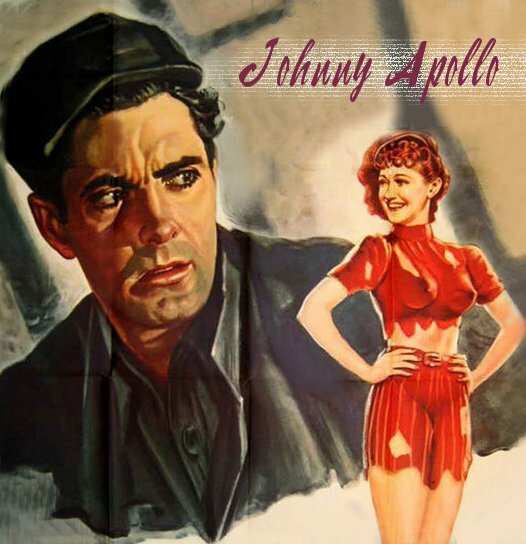 Johnny Apollo was the first movie in which Tyrone Power was directed by Henry Hathaway, who went on to direct him in 1940's Brigham Young - Frontiersman; 1950's The Black Rose; 1951's Rawhide; and 1952's Diplomatic Courier. Hathaway ran a distant second to Henry King (eleven Ty movies) in directorial duties in Ty Power movies. Other directors of Ty's movies directed in no more than one or two movies. 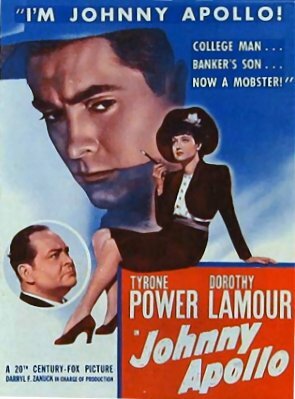 A couple of Ty's previous leading ladies were considered for the role of Lucky, played by Dorothy Lamour. Linda Darnell (previously in Day-Time Wife) was considered, as was Nancy Kelly (previously in Jesse James). Since the role of Lucky called for singing, neither Darnell or Kelly were right for the part. Also considered was Alice Faye, but she had other film commitments. Dorothy Lamour was loaned to 20th Century Fox by Paramount in exchange for Don Ameche, who was needed at Paramount for a movie called Midnight. The New York Times: The spectacle of Tyrone Power turning gangster for philosophical reasons will be a familiar one to those who saw Jesse James... The picture has other virtues.. primarily we should list the excellent journeyman direction of Henry Hathaway and the acting of Mr. Power, who maintains a nice balance between Harvard and the Tenderloin. The New York Daily News: "The Power fans were sufficiently curious about Ty's new role to stand for hours yesterday morning waiting for the Roxy Theatre to open its doors and let them in out of the rain. They were rewarded, while they dried themselves, by sitting in on a good story and by seeing Ty extricate himself from a very dangerous situation." New York World-Telegram: "In spite of all the cracks that have been made about his looks, there is a quality in his face which takes him out of the pretty-pretty class and makes him just right for the part." Variety : "Casting Power as a moster with a college degree isn't as incongruous as making him a Jesse James, and, what's more, he carries off the assignment quite well. New York Herald Tribune: "...unexciting, unmoving and unconvincing. It was fairly obvious when Mr. Power took on a racketeer role, it would be a special sort of racketeer role. The one he has in Johnny Apollo is exactly that..."